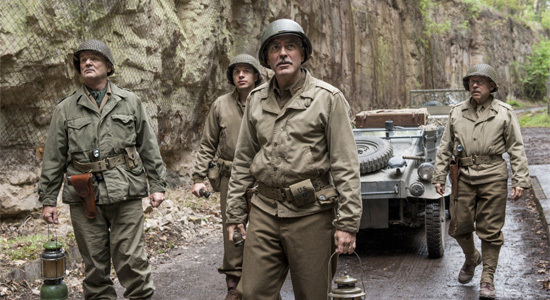 That handful of gifted actors includes George Clooney, Matt Damon, John Goodman, Bill Murray, and Bob Balaban as World War II-era Americans, sent as a squad behind enemy lines in Europe based on their respective skills. They are art scholars, and lead by Clooney, they are tasked by FDR with recovering the vast lot of artwork Hitler has stolen throughout Europe. The German leader has plans for a Fuhrer Museum loaded with the stolen art, and the platoon's job becomes stealing the pieces of art back and returning them to their rightful owners. The film is based on a true story, a very intriguing story, but the screenplay, adapted by Clooney, who also directs, and his long-time collaborating partner Grant Heslov, is loaded with problems. Chiefly among these is the shallowness of the characters those talented actors are embodying. There is a bit of backstory to each, a few family members addressed for dramatic effect, but as the story progresses the mission takes over. Hugh Bonneville as a British soldier mixed in with the squad has more backstory and genuine drama than any of them, but that is sadly and very quickly swept up by the mission. Characteristics (or rather just the one characteristic) that are raised early are hardly ever factors. These men are on in their years, much older than the troops already fighting, but after the basic training scene, short as that is, it's a subject that is hardly broached again. Balaban's character can't wait to kill Nazis early in the film, but his most intense scene involves sitting down and sharing a cigarette. Not exactly Inglourious Basterds. At least that film knew how to handle its tonal shifts. The Monuments Men goes from being upbeat war comedy complete with peppy score to somber reflective piece in jarring instances. There is very little drama surrounding that debate here, just a constant revisiting to the question and the sometimes tragic event to which that question ultimately leads. 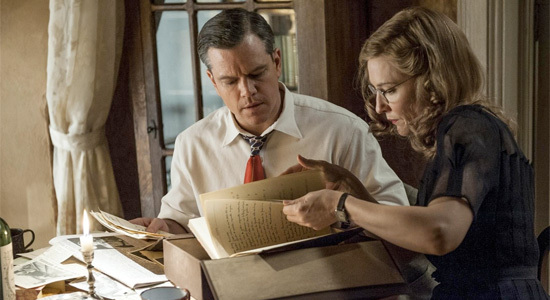 The bits of war The Monuments Men shows us are simple, rarely stirring up much suspense before the bullets fly and the letters home start getting written, but that's beside the point. Those moments don't even find a way to move the audience, constantly reveling in the menagerie of war tropes the film has decided to take on. Much of The Monuments Men feels like a hodgepodge of classic, WWII war pictures. It hits its comedic beats with varying degrees of accuracy. Some of the jokes work, most don't. They are all commonly choreographed, though, as are the moments of intensity on the other end of the emotional spectrum. Whether the comedy or drama works, you have a pretty good idea when each of those two kinds of scene is about to spring up, usually about 30 seconds before it happens. The success of the comedy and drama seems to be lain at the feet of the actors in The Monuments Men. Unfortunately, neither Clooney nor Damon deliver anything special here. Clooney's presence behind the camera has never hindered his work in front of it. At least until now. Beside the point that his character doesn't ask much of the actor's talents, he's still going at an apparent 50% speed, mumbling through speech after speech that rouses the audience about as much as the pre-movie Don't Text ads. It doesn't help that Clooney delivers one key speech early to his men via two-way radio, not a problem until it dawns on you that everyone involved is in adjacent rooms, roughly 10 feet from each other. It's awkward and bland. However, while the leads are chipping away at bogies, the supporting cast is hitting nice, par shots across the board. Even with the minimal amount of character they're given, Murray, Goodman, and Balaban are a delight every time they're on screen. The charisma they each bring is natural to the film's lighter moments, but it's when the film gets serious that the three really bring something powerful. The same goes for Bonneville and Jean Dujardin as the French member of the platoon. Cate Blanchett has a nice subplot as a French art historian who is forced to help the Nazis. She is the most developed character of the film, and though her performance isn't necessarily of the same caliber as she's given before, it's still easily the best in this film. But that isn't to say The Monuments Men doesn't have some historical value. It was important that these individuals watched over the culture that Hitler threatened, and for anyone who has laid their eyes on any of those works of art, it is still an important story. Sadly, The Monuments Men paints their deeds with broad but clumsily Hollywood strokes, to the point that the only thing that seems to be missing is Clooney standing in front of the Mona Lisa, whispering, "Earn this." I just saw this film and found it to be very entertaining. i went in KNOWING that the critics and the general public have been hating it, so it prepped me for the worst. but in reality, it's just a film that is misunderstood. clooney meant to make a film in the style of the time frame that it takes place. it's an adventure caper taking place in the 40's, almost made as if it was the 40's. the word 'CORNY' is actually well suited. it is corny. the music most of all is corny, as you will recognize right from the beginning of the film. but clooney is a smart filmmaker, and this must be what he was going for. because it is meant to bring a fun adventure to a story that literally 1% of the world was aware of. its a film about a serious topic that doesn't take itself too seriously. it's not a masterpiece, but not as bad as critics make it out to be. It's a good solid, fun film. Cheese and corniness are in this film, if you don't like either, do not see it. If you can accept any film, go for it. you'll have fun. I agree with you. The corniness did not seem to fit the time and place in which they were executed. Still a fascinating movie on this particular topic though. This wold have been the most disappointing film of 2013 if it hadn't been held over.